A biotic factor is a living thing that has an impact on another population of living things or on the environment. Abiotic factors do the same thing, but they are non-living. Together, biotic and abiotic factors make up an ecosystem. To survive, biotic factors need abiotic factors. In turn, biotic factors can limit the kinds and amounts of biotic factors in an ecosystem. 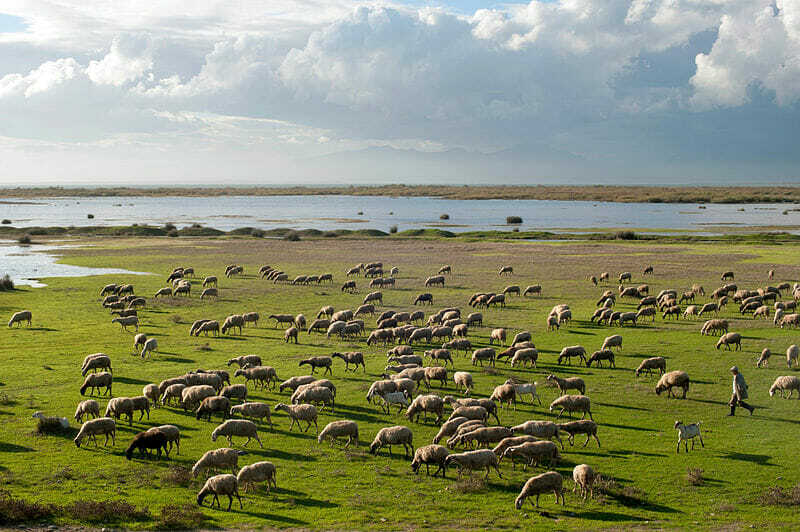 The photo above shows a herd of sheep grazing near a lake in Greece. How many biotic and abiotic factors can you find? The word autotroph means “self-feeder.” Also known as producers, the organisms in this category are mostly green plants and algae which make their own food through photosynthesis. The energy that they store serves as food for the consumers and decomposers (see below) either directly or indirectly. Autotrophs that don’t use photosynthesis to make their food use another process called chemosynthesis. In this case, organisms take organic material from their environment and transform it into organic nutrients, without the need for sunlight. A good example of this are the specialized bacteria that live near hydrothermal vents in the ocean and extract hydrogen sulfide from the water. Autotrophs use some of the energy they make to change elemental carbon into organic compounds (called carbon fixation) during photosynthesis or chemosynthesis. Although they feed on simple food sources, autotrophs are the base that drives the entire ecosystem. Heterotrophs (“other feeders”) are consumers in the ecosystem. They eat more complex organisms like plants and/or animals. Some examples of heterotrophs are bacteria, protists, fungi, herbivores (deer, cows, sheep), carnivores (bears, lions, dogs) and omnivores (birds, squirrels, rats and humans). In fact, about 95% of all living things on Earth are heterotrophs. Unlike autotrophs, heterotrophs don’t have fix carbon, so they can take advantage of all the energy from the food they eat. Detritivores are also consumers but they get their own category because of what they feed on. These organisms are also referred to as the decomposers, and they either eat dead organisms directly or break down dead things to get energy. Examples of detritivores are earthworms, fungi, dung beetles, millipedes, sea stars and fiddler crabs. The complex cycle of interaction between biotic and abiotic factors continues as the decomposers clean up after the producers and consumers, but serve as food for the heterotrophs at the same time. Climatic factors are things like water, sunlight, humidity, climate, temperature and pH. For organisms that live in the water, sound waves, tides, water clarity, sunlight exposure and pressure are considered abiotic factors. The wind is a great example of an abiotic factor that effects many others. For example, wind direction and speed can affect humidity and the wind can disperse seeds in the air which helps with pollination and gives plants the opportunity to spread. Edaphic comes from the Greek word edaphos which means floor. It refers to abiotic factors like the geography of the land and soil characteristics such as the mineral content. The topography of land such as elevations, mountains, valleys, depressions and slopes all contribute to the characteristics of an ecosystem. Similarly, soil characteristics like composition, texture, structure and density determine what creatures live in it and what plants can grow in it. How land and the resources in an area are used are examples of social abiotic factors. Humans have an impact on many abiotic factors, but the social ones are particularly susceptible to larger scale change and this can have profound impacts on other abiotic factors, biotic factors and ecosystems. Examples of social abiotic factors are clear-cutting of forests, mining, damn building and farming.